This chapter aims to explore what “entities” in the Web of Data are. As a point of departure we examine a number of widely used RESTful Web APIs in terms of URI space design and hyperlinking support in the offered resource representations. Based on the insights gained from the API review, we motivate the concept of an entity as well as its boundaries. Eventually, we discuss the relevance of the entity concept for publishers and consumers of Web data, as well as the impact on Web data design issues. The author would like to thank Richard Cyganiak for the conversations regarding the notion of document, Mike Amundsen for deeper insights into hypermedia linking aspects, as well as Jonathan Rees and David Booth – in the context of the W3C task force “Architecture of the World Wide Semantic Web” – for ongoing discussions around HTTP semantics. 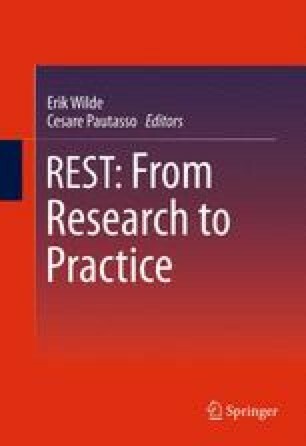 Last but not least, the author wants to express his gratitude to Erik Wilde for his feedback and his continuing support to ensure that the chapter focuses on under-represented topics in the REST research.